Our customer service team is happy to answer your questions and sales inquiries. Are you an industry or design professional? Get access to our industry-only white glove concierge service by visiting our Elite Pro page. We receive a wide variety of inquiries every day. Feel free to browse through our frequently asked questions, or ask us directly through the contact form below or by phone. We’d love to hear from you. 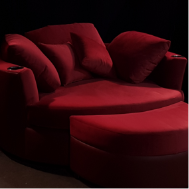 Call our head office at 604-575-8310 and speak to one of our Theater Seating Specialists so that we may assist you with layout recommendations, fabric sample requests or any other questions you may have. Quotations are provided upon request, however only retail pricing is quoted. 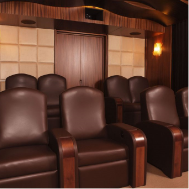 Wholesale quotations and discounts are provided to registered Home Theater Dealers, Interior Designers, and Home Builders. 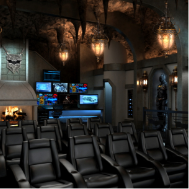 Click on the “Design Your Chair” link to custom build your perfect theater chair built to your specifications. 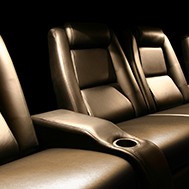 Once you have customized your theater seating, submit your configuration and we will reply within 1-2 business days. E-mail us at sales@elitehts.com to see if there is an authorized dealer in your area. Please provide city of residence and we will reply to your inquiry within 1-2 business days. Do you offer discounts to interior designers, home theater installers, or home builders? How do I know how many chairs or what layout I should choose? If you are unsure about how many chairs you require and/or what layout would be best suited for your project, we can offer suggestions. In addition, we now offer complimentary 3d layout design services to registered Interior Designers, Theater Installers and Home Builders. Simply fax or email us a rough sketch of your room with measurements and we can usually provide a detailed 3d rendering within 48 hours. An example of a 3d layout can be seen below. How much clearance is required behind each chair? 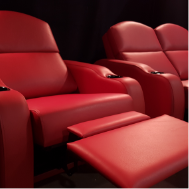 All of our theater chairs are a “WallSaver” design so only 4”(10cm) needs to be allocated behind the chair and 28”(71cm) of aisle space is recommended in front of the chair for the extended footrest. How wide does my doorway need to be? A 22” opening (56cm) is all that is needed since the “back rests” come detached from the chair base during shipping. Our typical lead time is 12 – 14 weeks. Depending on the style/model ordered, we may be able to complete the order sooner. Please contact customer service for the most up-to-date lead times. Do your theater chairs require assembly? All of our theater chairs come individually pre-assembled (arms come pre-attached to the bases), so therefore the only assembly required is attaching one chair to the next within a row, so that the chairs do not shift around. This is done using standard wood screws which we provide (power drill recommended). The back rests are shipped laying flat so that the chairs can be easily moved in and out of small doorways. Are your chairs motorized and do they support 110v and 220v? 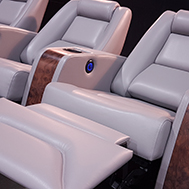 All of our theater chairs are motorized and our transformer is universal so it is specially made to accommodate 110v and 220v in any country. Are loveseats motorized as well and does each seat recline independently? Yes, each chair in a loveseat configuration is motorized and reclines independently. How do I know which foam firmness to choose? We offer Soft, Medium and Firm options however 90% of our customers choose our standard “Medium” foam firmness. Our customers who choose Soft or Firm usually have very specific requirements or an affinity for either foam type. What is the difference between Valentino leather and Silk leather? Our Valentino Leather is our standard, natural, top grain, Italian leather. Silk Leather on the other hand is a synthetic , breathable and slightly stretchy material that is extremely soft like Silk, yet has the visual and spill resistant qualities of leather. Silk Leather however is very costly to manufacture and is therefore 15% more costly than our Valentino Leather. Do you offer manual recline? Yes we do offer manual recline, however this is considered a custom order with a nominal surcharge since all of our seating is power recline. How is your swivel tray/iPad holder integrated into the chair? 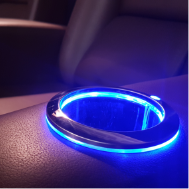 Our Swivel Tray and iPad holders are completely removable and easily slide in and out of our cupholders without any tools. Can I provide my own fabric or material? Yes. Since we are the manufacturer, many of our orders use COM (Customers Own Material). Do you offer custom embroidery, logos, and family crests? Yes, we can embroider and digitize almost any design that is sent to us. Since we are the manufacturer, we can accommodate most custom option requests. Our standard options include Piping, Storage Compartments, Removable Swivel Trays, and Crowson Tactile Sound Transducers. For images and more information please view our “Gallery” section. Do you build custom chaises and sectionals? 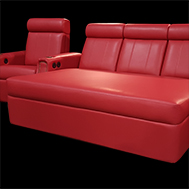 Yes, any of our theater chair styles/models can be modified and converted into a chaise or sectional configuration. What if I receive the chair and don’t find it comfortable? What are my options? The good news is that because our chairs are completely modular, the seat cushion and “back rests” can be modified or switched out to a different style after receiving the chair. There is however an applicable surcharge depending on the style/model of the chair. The arms however are pre-assembled and connected by screws and bolts, so it is more challenging to replace and switch the arms. Alternatively, in the past we have occasionally built and sent a single chair to a client for evaluation. The remaining chairs in the configuration are sent once the customer is satisfied with the chair. Again, there is an additional surcharge for this service. What type of warranty do you offer and how is it honored? Our standard warranty is 20 Years and this covers the reclining motor, mechanism, and chair frame. Upholstery is covered by a 5 Year warranty. Since we ship our product all over the world, we have designed our chairs in such a way that the various parts can easily be repaired or replaced if necessary. For example, our reclining motor easily slides in and out of the chair mechanism, and can be switched out with a new motor within 5 minutes. Our “Back Rests” also slide on and off the chair base with ease, so they can easily be sent back to us for repair or replacement. The chair arms and seat cushions however come to you pre-assembled and are held in place by screws and bolts, so some tools are required in case of repair or replacement. If on-site repair is needed, we can usually send a local upholstery servicing company to you or reimburse you for any repairs rendered. Do you have any shipping limitations? We ship all over the world and there has not yet been a country that we have not been able to deliver to. Deliveries within North America are usually by truck, but many of our International orders go by sea or air. Some cities and airports throughout the world limit the size of their aircraft, therefore we must package and ship those orders accordingly. Do you offer white glove delivery or in-home setup? Depending on your area, In-Home Setup is offered however there is a surcharge for this service, and delivery time is longer usually because of logistical planning and coordination as opposed to standard Driveway Delivery.